Transect Diagram by DPZ & Company, modified by S. Sorlien 2010. Please visit the Center for Applied Transect Studies and Smartcode Local for information about planning for walkable neighborhoods, including downtowns. A transect is a cut or path through the environment. In each town or city, we sample (by measuring and photographing) the DNA of the best parts of their local rural-to-urban transect. 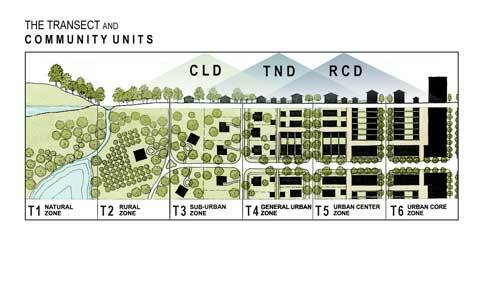 That's what New Urbanists use to customize a new zoning or design code to replace dysfunctional separated-use zoning. Identifying changes along a transect allows us to protect and create distinct habitats within walking distance of each other, from farmlands to the center of town. Follow the Street Trip blog for day-to-day adventures along the Transect.